The QDoppler is a diagnostic ultrasound device used to aid the clinician in obtaining systolic pressure values at the arms, legs and feet. The device will provide a bi-directional Doppler for detecting presence or absence of blood flow, and will control the inflation and deflation of a pressure cuff under direction of the user. Three additional modalities, Pulse Cuff Recording (PCR), Photoplethysmography (PPG) and Electrocardiography (ECG), will provide additional information for the clinician. PCR will be used as a plethysmograph to obtain alternative blood flow waveforms, the PPG will be used primarily to obtain toe pressures and ECG will be used primarily to obtain the heart rate. The unit will calculate Ankle Brachial Index (ABI), Toe Brachial Index (TBI) or segmental values once the clinician has accepted or entered the appropriate pressure values. Waveforms, pressure values, and index results can be printed directly from the device or uploaded using QDoppler report generating software and an external user supplied PC via a USB port. The unit can run from an internal power source or from an external power supply, and mounts to a rolling stand. The QDoppler system is non-invasive peripheral vascular diagnostic system. The QDoppler is a complete peripheral vascular system that supports 2 or 4 independent pressure channels, 2 or 4 PPG sensors, and 2 Doppler frequencies. The software level of concern for the QDoppler products is determined as Moderate. Some of the main features include patient details and patient database management; printing configuration and printing options; writing examination reports; summary screen support; configuration and management of examination protocols; measurement site configuration; export in various formats; backup features; restoring backup data; online help options; and review stations. Also the standard signal control options and signal display options, as well as measurement calculations. The quantitative measurements and the main measurement of the QDoppler is segmental systolic blood pressures. In general, the measurement is conducted by applying an appropriately sized cuff to the measured segment, obtaining a reference PPG or a Doppler signal in a location distal to the cuff placement, and then inflating the cuff to such a pressure that will occlude the blood vessels and prevent blood flow distal to the cuff location, which will result in disappearance of the reference signal. Then, a slow cuff deflation begins, and the instantaneous cuff pressure at which the reference signal reappears is typically defined as the segmental systolic blood pressure. While the software automatically places a cursor at the time location which is suspected as being the systolic pressure, it is the total responsibility of the system operator and the medical staff to modify the cursor location according to their medical training, and define the correct segmental pressure. Based on the segmental pressures, the pressure indices are calculated, as the ratio between the systolic segmental pressure, and the higher of the 2 brachial systolic pressures. The ABI index is a commonly used index, which is a specific case of the above, calculated as the systolic right or left ankle pressure, divided by the higher of the right or left brachial systolic pressure. The standard main Doppler parameters that are calculated, include: Mean, representing the time-average value of the envelope (maximal velocity/frequency) over one cardiac cycle; Peak representing the maximal systolic velocity/frequency during a cardiac cycle, in units of cm/sec or KHz; Diast, representing the minimal diastolic velocity/frequency during a cardiac cycle, in units of cm/sec or KHz; P, representing the Gosling Pulsatility Index, calculated based on the peak envelope as (peak systolic velocity - minimal diastolic velocity) / mean velocity; RI, representing the Pourcelot Resistance Index, calculated based on the peak envelope as (peak systolic velocity - minimal diastolic velocity) / peak systolic velocity; S/D, representing the systolic to diastolic flow ratio, and is calculated based on the peak envelope as: (peak systolic velocity / minimal diastolic velocity); and HR, representing heart rate in beats (number of cardiac cycles) per minute. Additional parameters that are displayed are related to the specialty tests. During exercise stress testing, a digital timer indicates the duration of the exposure to stress (for example the total time the patient exercised), and the recovery time for each measurement (the time that passed since the end of stress exercise and the current measurement). During venous refluxc testing the system automatically places vertical cursors that denote the minimal PPG signal after sequential leg dorsiflexions and the point in time that the PPG signal returns to pre-dorsi flexion baseline. The time difference between these 2 cursors is calculated and referenced as the VRT (venous refill time). It is the responsibility of the examiner to determine the correct vertical cursor position, hence adjusting the VRT parameter. Likewise, the MVO/SVC ratio is based on the horizontal baseline and plateau signals, and the rate of signal drop immediately after rapid deflation of the thigh cuff. Again, it is the responsibility of the examiner to determine the correct cursor positions for the parameter calculation. The QDoppler complies with Class B3 EMC requirements. Therefore, the QDoppler is suitable for use in all establishments, including domestic establishments and those directly connected to the public low-voltage power supply network that supplies buildings used for domestic purposes. - A power switch that, when turned on, indicates this with a green light. - 2 or 4 PPG connectors, color coded in red, green, blue, and green. - Doppler probe connector, with frequencies of 5, and 8 MHz. - A color-coded connector for 2 or 4 air NIBP tubes: red, blue, yellow, and green. - 12 leads ECG connector. Each QDoppler device displays 2 connectors at the back panel. One is the power supply, and another one a USB connector to connect the QDoppler via USB cable to the host computer. The QDoppler device works with any approved 5V medical power supply once connected. All other supportive device components, such as keyboard, mouse, printer, and USB connect directly to the host computer. The QDoppler concept provides a full-featured ABI/vascular to aid the diagnosis of peripheral arterial disease (P.A.D.). It is fast, efficient, meets reimbursement criteria, and offers 3 modalities for obtaining systolic pressures and ankle waveforms. To retrieve ankle waveforms that are required for reimbursement, either pulse volume recording (PVR) or a bi-directional Doppler probe can be utilized. The system comes with a total of 2 or 4 pressure cuffs, and step-by-step exam instructions are supported by graphic waveform display. The process of performing exams is accelerated through automatic cuff inflation and deflation and automatic indices calculation. The QDoppler accommodates both standard and custom protocols, and includes PC download software to accommodate interface with various EMR systems. Please contact your local sale representative for more detail information. Some testing modules in the US version may not be available or may be available for research purpose only. Non-invasive arterial testing is an essential diagnostic tool, especially when it comes to extensive wound care, as it delivers crucial information in a non-threatening environment such as a radiology unit or hospital. Data can be collected with the help of a lower extremity Doppler, photoplethysmography (PPG) and pulse volume (PV) arterial - these are excellent diagnostic vascular tests, which should be carried out prior to duplex scanning and before a referral is made for either MR or CT angiography or invasive arteriography. Silent asymptomatic peripheral vascular disease, in several recent studies, has been linked to death from myocardial infarction and stroke, and therefore many more patients should have ABI testing. In a current study, the American College of Cardiology, 1 made this recommendation as a means of screening patients for dangerous silent heart disease. In comparison with a screening of cardiac examination; such as stress testing etc., conducting basic non-invasive arterial testing is not only an economical method but, considering the ever increasing number of diabetic and ischemic patients seen by podiatrists, it also provides excellent reason for this type of diagnostic equipment to be available in every podiatrist's practice. As they are digital units, many of them provide software that support professional looking reports with very little preparation, among them wave form analysis, and automatic calculation of ABI's and TBI's - no need for any hand pasting of printouts or the production of hard copies anymore. Some device software provide measurement of changes on the PV Arterial and PPG, and many even allow for measuring peak velocity on Doppler, a method that was until recently only available with a far more advanced duplex scanning. The reports are informative, easily prepared and, besides being an effective communication tool for the patient's primary care physician, they are also compelling marketing tools that represent your work and practice. To draw out arterial pulses, the Doppler component pertaining to non-invasive arterial studies uses a high frequency sound wave. What is defined as a normal audible sound wave, is a clear sounding wave which, in harmony with the sinus rhythm of the cardiac systolic beat, repeats itself on a regular basis. The appearance of quick beats or pauses can be indicators of bi- or trigeminy or other cardiac arrhythmias. The performance of a peripheral Doppler Study by a podiatrist could be the first time that signs of a cardiac arrhythmia are discovered and diagnosed. In such a case, the patient should as soon as possible be referred back to his or her primary care physician or cardiologist, as high pitched Doppler sounds are generally suggestive of a more proximal stenosis. Should they appear in concurrence with very high arterial pressure, this is suggestive of an arterial wall calcification. ABI is calculated by ankle systolic pressure/brachial systolic pressure. It is important to note that vessel calcification can cause an above normal ABI and suggest a false elevation of the lower extremity pressure. Abnormal blood flow and volume can be determined by the analysis of the arterial wave form with further information made available through PV Arterial and PPG. The toe systolic pressure (measured with either a PPG or Doppler) divided by the brachial systolic pressure provides you with the TBI. A possible indicator of the healing probability in a diabetic foot ulcer is a toe pressure of greater than 30 mmHg, while poor perfusion is suggestive with a PPG waveform showing slow recovery. Any pressure difference between two adjacent levels of less than 20 mmHg is considered within normal limits. Any pressure difference between two adjacent levels exceeding 20 mmHg is considered abnormal 6. Further analysis of waveform variations will assist the examiner in determining the level of obstruction. Treadmill or reactive hyperemia studies (analysis of how long it takes for flow to resume to normal after cuff deflation) will assist in determining the extent of obstruction. Photoplethysmography (PPG) is based on the determination of the optical properties of a selected skin area. For this purpose, non-visible infrared light is emitted into the skin. More or less light is absorbed and determinations about the measurement of the reflected light can be made, using the optical properties of tissue and depending on the blood volume changes. PV Arterial is useful in detecting arterial occlusive conditions in the lower extremities solely through analysis of waveform patterns Table 5 8. This method is sufficiently sensitive even for distal digital studies, and is useful in patients in whom vessel wall calcification prevents accurate Doppler signal processing and occlusion-cuff pressure measurements. Rapid upstroke during systole with a sharp peak at maximum amplitude. A more gradual down stroke following peak amplitude. A dicrotic notch midway in the down slope. The dicrotic notch is a particularly prominent feature of PV waveforms obtained from arm arteries. After the dicrotic notch, the pattern curves or bows toward the baseline. The first sign of abnormality is the absence of the dicrotic notch. Distal to more significant occlusions, the slope of both the ascending and descending segments of the trace decreases and rounding of the systolic peak is noted. As the obstruction increases, the waveforms will become level. Abnormalities in the peak velocity may be indicative of stenosis and occlusion. In early stages of stenosis and occlusion, the peak velocity distal to the occlusion may actually increase. Therefore, any significant abnormality should be noted and compared with other components of the non-invasive study prior to drawing any conclusions. The QDoppler is a physiologic examination concept for the diagnosis of peripheral arterial disease (P.A.D.). 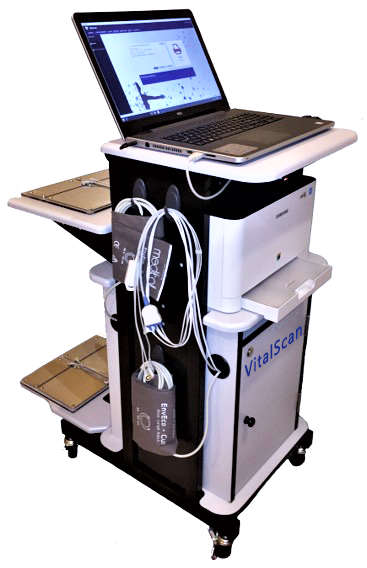 The unit, designed to assist clinicians with the collection of data and features provides besides a sensitive, bi-directional Doppler system, an arterial photoplethysmograph (PPG), and a pressure system that supplies inflation, controlled deflation, and pulse volume recording (PVR) capabilities. The ankle brachial index (ABI) examination, the most advanced level in terms of diagnosis standards for P.A.D. is one of the tasks the QDoppler is well suited for. The ABI compares the systolic blood pressure at the ankles with the systolic pressure at the brachial arteries, and significantly reduced ankle pressure results in a low (<0.9) ABI value, an indication of P.A.D. With the help of a pressure cuff and audio Doppler probe, the systolic ankle pressures are obtained. A single level, lower extremity arterial test entails ABI pressures, arterial physiologic wave forms and calculated index. The QDoppler supplies two types of waveform modalities: continuous-wave (CW), bi-directional Doppler and PVR. Generally it is not required to include both PVR and Doppler waveforms, even though both model types have significant clinical efficiency. The QDoppler model supports the performance of segmental studies that compare three or more lower limb pressures to the brachial pressures. This procedure is rated as a complete bilateral study - a non-invasive, physiologic study of upper or lower extremity arteries, multiple levels, or with provocative functional maneuvers - and therefore reimbursable. The Doppler waveform is a graph with a vertical axis (Doppler frequency shift, or pitch) proportional to the velocity of arterial blood flow. It indicates flow toward the probe above the baseline and flow away from the probe below the baseline. The 8MHz, bi-directional probe is best for superficial vessels and all-around use, while the optional 5 MHz, bi-directional probe is better suited for deeper vessels and with some obese patients. Pulse Volume Recording (PVR) is a form of plethysmography, which is an indirect method of limb volume measurement. It is measured by applying a pressure cuff to the limb and inflating it to 65 mmHg at which time it identifies the fluctuations per minute in limb volume related to each heartbeat. The PVR waveform's contour is a qualitative indicator of presence or absence of peripheral arterial disease. As this kind of PVR does not allow calibration by injection of a known air volume, it is instead used for arterial waveform analysis. Photoplethysmography (PPG) is an optoelectronic technique that observes minor changes of blood volume that take place in the capillary bed. With the help of PPG probe, infrared (IR) light is emitted into the skin. The underlying tissue reflects the light that is taken in through a detector and then transformed into an electrical signal. The arterial blood supply determines the signal's pulse contours, because blood attenuates IR light at a higher level than the surrounding tissue. A PPG system of that kind is primarily meant for arterial pulse detection. When used in conjunction with a digit cuff, arterial PPG is a useful tool for toe pressure measurement, especially in cases when the arteries at the ankle are not compressible (ABI > 1.30) due to calcification. Particularly among patients with diabetes or kidney disease calcified arteries are prevalent, but the small arteries of the toes seldom become calcified. Once the QDoppler has been configured for PPG, the system will automatically indicate a low TBI (<0.65) and arterial obstruction, by calculating the toe brachial index (TBI). In summarizing, the QDoppler system includes all that is necessary to handle quick, efficient peripheral arterial examinations including Doppler probes, PPG probe, display, printer, pressure hose, a digit cuff and limb pressure cuffs.